Earlier this year, to celebrate 40 years of artist Ian Kennedy working on the title, Commando reprinted four of the stories that he had illustrated for them. 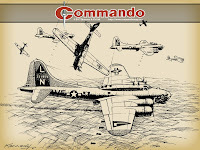 Despite being their top cover artist, having painted around one quarter of all the Commando covers used over the title's near half century of publication, and having illustrated many stories in the various IPC combat Picture Libraries in the 1960s, Kennedy has only ever illustrated five Commando stories. 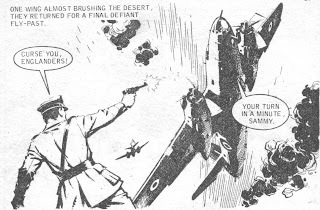 With the other four reprinted in the comic in 2010 the Commando office decided to reprint the fifth story, The Sand Devils, on-line and the final part of the story has now appeared on the Commando Mag website. The Sand Devils was originally published as Commando issue 832 in April 1974, written by R.A. “Monty” Montague with a cover not by Kennedy himself but by Carlo Jacono. The story is set in North Africa during World War II and follows the adventures of an RAF Marauder bomber squadron as they attack and are attacked by the Axis forces. Kennedy's aircraft art is typically dynamic and his renditions of the little known Marauder aircraft are superb. All 63 pages of the story are on-line beginning and you can read them for free beginning here. In addition to the ongoing story the website has started to include some of the single page illustrations by Kennedy that adorn the comic's inside covers. To tie-in with the D-Day anniversary this year the website put up a series of these pin-ups formatted as PC wallpapers including this illustration of American B-17 Flying Fortress bombers being attacked by Luftwaffe FW190 fighters. 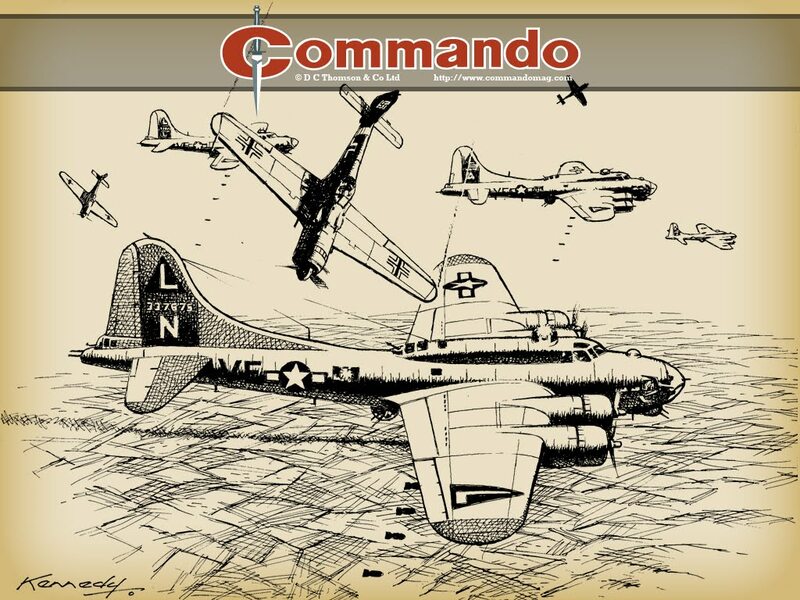 The Commando Mag website is here. Ian Kennedy's The Sand Devils begins here and his D-Day related illustrations are here and here. "Widely recognised as being a valuable means of encouraging people to read more extensively, graphic novels have become a sought-after feature of our programme." Reading such a statement on page 8 of the 2009 Annual Report of the Edinburgh International Book Festival seemed to bode well for the 2010 Festival maintaining the comics content of their programming at the same high levels we have become familiar with in the last couple of years. So the disappointingly small selection and type of comics related events in this year’s programme came as something of a surprise. It would seem that the decision makers at the Festival have backtracked on the progress made on the subject of comics over the last couple of years with this year’s events falling into two distinct categories - the political cartoonists and their newspaper work for the adults and workshops by the comics people for the children, each workshop with specific age ranges to keep any adults away. This year there are no talks by comics creators aimed at the family audience, none by big name graphic novelists aimed at the teen and adult audience, and no discussions with creators or presentations by academics on the merits of the medium. That said, what little is in the programme is of a high standard. The If... and Doonesbury combination of newspaper cartoonists Steve Bell and Gary Trudeau is a major coup for the BookFest. It is also good to see that comics creators Glen Dakin, Garen Ewing and Sarah McIntrye can show off their undoubted talents and pass on their enthusiasm to the primary and early secondary school children that their various workshops have been advertised for. However, where are the evening talks by comics and graphic novel creators that have graced the Festival for the last couple of years? 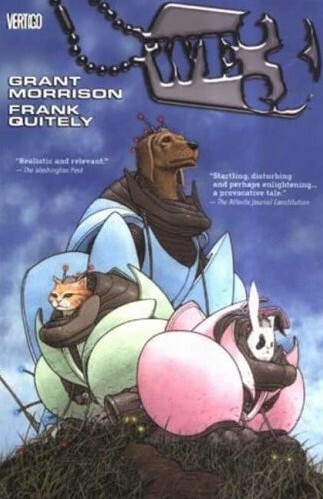 Creators of the calibre of Bryan Talbot and Posy Simmonds appeared in 2008 while Neil Gaiman and Mark Millar were there in 2009. Indeed, the same page of the 2009 Annual Report recognises the quality of last year's comics creators by stating, "Designed to appeal to teens and adults, our graphic novel events featured huge talents including Neil Gaiman, Mark Millar and Ian Rankin (making his debut into the medium)." It wasn’t as if the comics events in previous years weren’t financially successful for the Festival. In 2009, as we reported here, of the 12 events in the programme that could be considered comics related, nine sold out before the Festival even opened. That sell-out rate of 75% put them well above the overall 2009 Festival average of 45%. As for comics related sales in the Festival bookshops, the 2009 report states, "Neil Gaiman and Ian Rankin's joint event on graphic novels produced a long and enthusiastic queue of fans, resulting in excellent sales." After the visibility and prestige that comics and their creators have received in recent years at the Edinburgh International Book Festival, it appears that having a new team in charge has set the cause of comics and graphic novels at the festival back by years. Let us hope that things will improve in 2011. What do ILM special effects men do in their time off? For Bill George, who has an impressive CV that includes original and new Star Wars movies as well as Indiana Jones, Star Trek, Harry Potter and Twilight films, his time off is used to create models of old TV and film spaceships and then to insert them into a real world situation where, if they were indeed real, members of the public would be able to interact with them. To this end he has created the impressive Sci-Fi Air Show. 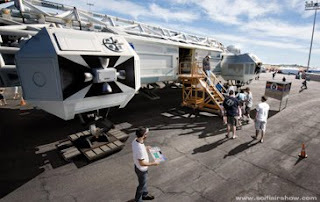 The website's concept is that the spacecraft that we saw in TV series such as Space:1999, Planet Of The Giants or original Battlestar Galactica were not special effects models but real flying vehicles built for the series that they were used in. 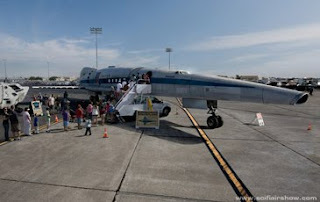 Once the filming was completed, they passed into collectors' hands in the same way that older military aircraft can pass into civilian hands and they now have joined the real airshow circuit as many older military aircraft have. 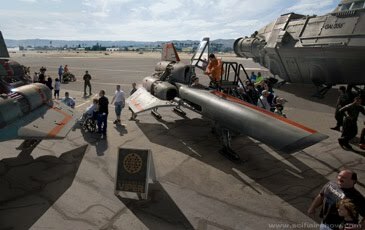 In the same way that a real air show would show off aircraft in the air or in static displays with fighter cockpits and transport aircraft holds open so that visitors can see into them, the Sci-Fi Air Show has photos of Vipers with their canopies up and Eagle transporter pods open for visitors to walk through. George has taken this one step further by providing backgrounds for some of the vehicles, from how they were designed, manufactured and flown in the series, to how they came into the hands of the current owners and the problems those owners had in getting and then keeping them air, and even space, worthy. 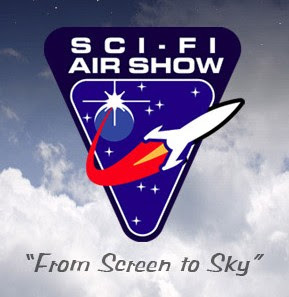 The Sci-Fi Air Show currently has three Vipers and a Galactica shuttle from original Battlestar, an Eagle transporter and Hawk attack craft from Space:1999, the Spindrift from Land of the Giants, the Flying Sub from Voyage To The Bottom Of The Sea and the Orion shuttle from 2001: A Space Odyssey. You can also see Star Trek shuttlecraft and a 2001 Moonbus in the backgrounds of some of the photos. The flying craft are shown on the ground with their undercarriages deployed and often with people queuing to get a better view which, of course, then shows off the size of the original craft. It would be even nicer to see them beside real aircraft with, for instance, the Galactica Vipers beside F-16 Fighting Falcons, the real jet fighters that are nicknamed Vipers by their pilots, or a Space:1999 Eagle beside a Sikorsky S-64 Skycrane helicopter that was the spaceship's original real world inspiration. Perhaps such ideas will come in further updates to this already impressive site. • The Sci-Fi Air Show can be found here. Fans raise thousands for Frank Sidebottom creator's "Fantastic Funeral"
The sad news came out this morning that Chris Sievey, aka Frank Sidebottom, who died on Monday aged just 54, would have a pauper's funeral. The comedian's financial affairs when he died mean that his family were struggling to do him and his memory the justice it deserves - but Frank's many fans now have a way to contribute to the costs, with over £7000 raised so far. "Frank Sidebottom never became the huge tv star he deserved to be," notes cartoonist Lew Stringer in a glowing tribute on his blog. "Television couldn't pigeonhole someone so unique and he was a performer you either "got" or you didn't. For those of us who did "get" his comedy he'll always remain forever fantastic." • All donations will be acknowledged. For the latest information on the fund raising visit the Frank's Fantastic Funeral group on Facebook. After the run of Scottish comics events that we have been reporting on over the last few days, it seems appropriate to mention the biggest Scottish comics event of them all, the Highland Expo - Hi-Ex. In 2007 when Richmond Clements and Vicky Stonebridge started planning their Highland Comics Exposition they can hardly have envisaged that they would still be at it four years later. That first Hi-Ex comics convention took place in Inverness' Eden Court theatre in February 2008 and Hi-Ex 4 will return there once again in 2011. Hi-Ex has always supported the same charity over its three years, Children 1st, and this year the convention presented them with a cheque for £2331.35 raised by the charity auction, raffles, signings and various other activities over that busy weekend in March. This total more than doubled the amount that the convention had raised for the charity in its previous two years. The dates for Hi-Ex 4 are 26-27 March 2011 and when it will be held in the Eden Court Centre on the banks of the Ness River in the centre of Inverness. More details will be available on the Hi-Ex website closer to the time. The downthetubes reviews of the three Hi-Ex conventions to date are here - 2008, 2009 and 2010. Adam Cadwell only has five more strips to go before he finishes The Everyday, his web-strip about, well, stuff that he notices in his everyday life. If you haven't caught it yet, it's worth a gander. 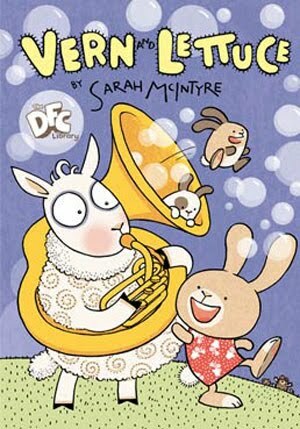 Are you reading Phil Spence's Ninja Bunny? 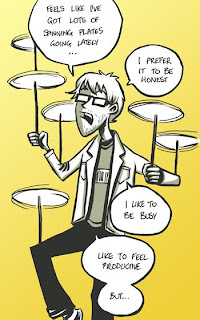 Well worth your time... as is Marc Ellerby's diary comic, Ellerbisms. Oh, and according to John Allison, the 't-shirt as vital part of the web-comic money-making ecosysytem' bubble has burst. You can console him by reading his excellent Bad Machinary and then help him by buying his stuff. The Edinburgh International Book Festival may be the largest literary festival in the UK but Edinburgh also has one of the smallest. The West Port Book Festival was set up by the many second hand books shops that crowd together in the city's West Port, the original western gateway of the city, in the shadow of the castle itself. The small festival begins on Thursday 24 June and runs to Sunday 27 June and they have just announced that they are to be joined by artist Frank Quitely at 3:30pm on Friday 25 June for a talk on his artwork which includes WE3 and All Star Superman. The event will take place at Edinburgh Books at 145-147 West Port where writer and editor David Bishop will chair the talk. Tickets are free and can be collected from Edinburgh Books either from 5pm-6pm on Thursday 24 June or from 10am on Friday 25 June until they are all allocated. There are more details of the event on the West Port Book Festival website. It is the biggest literary festival in the United Kingdom and over the last few years the Edinburgh International Book Festival has taken a very active interest in comics and graphic novels. This year’s BookFest begins in Edinburgh’s Charlotte Square Gardens on 14 August and it runs until 30 August. This is a workshop for the 12-15 age group on how to create a comic book taken by Glen Dakin whose work has appeared in Paul Gravett’s Escape magazine as well as Marvel UK’s ClanDestine and The Real Ghostbusters and who is now better known for writing children’s books. This is a workshop for the 10-12 age group on how to design a classic adventure comic by Rainbow Orchid’s Garen Ewing. American Garry Trudeau of Doonesbury and British Steve Bell of The Guardian’s If… are two of the best known and acclaimed political cartoonists in either side of the Atlantic and this promises to be an interesting conversation between the two men. The programme describes Cedar Lewisohn as a contributor to a major new book on the subject of how comic artists have satirised and lampooned the politicians of their day and that his talk takes a look at Britain through the eyes of its cartoonists. While it doesn’t say it, this would appear to tie in with Tate Publishing’s Rude Britannia: British Comic Art book, itself a tie in to the Tate’s Rude Britannia exhibition. This is a workshop for the 5-7 age group from the DFC’s Sarah McIntyre as a preview of her Vern and Lettuce book from The DFC Library. Children are asked to bring their own pen and “a lot of gusto”. Tickets prices for the talks are £10 and for the workshops £4. 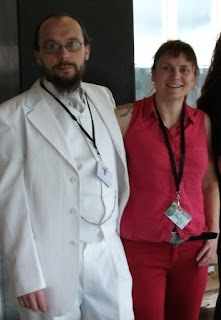 In addition to the public programme, Garen and Sarah will be taking part in the Festival's Schools Programme covering all primary school ages between them. Sarah will start with Monsters and Aliens Let Loose! for Primary 1 to 3 classes followed by a Comics Jam with Vern and Lettuce for Primary 3 to 5 while Garen will be doing a comics workshop for Primary 5 to 7. It should be stressed however that none of the Schools Programme events are open to the public. 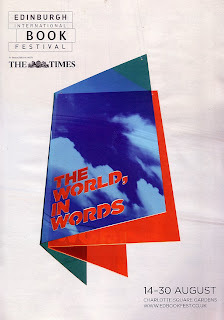 The full programme of the Edinburgh International Book Festival is available to download as a PDF from their website. Tickets for the talks and workshops go on sale on Saturday 26 June 2010. There is just 1 week left before the fourth annual Dundee Comics Day, part of the Dundee Literary Festival, which is taking place at Dundee University's Tower Building on Sunday 27 June. This year's theme is Creating Comics and the guest speakers for the day include artist Alan Davis, designer Rian Hughes, writer Pat Mills and editor Dez Skinn. With the addition of a workshop on creating Manga run by artist Nana Li, Dundee's impressive line-up of guests cover the entire range of comics creation from writing and artwork, via design and editing, through to publishing the end product.